In Kentucky, basketball means everything -- especially college basketball, and especially the intrastate rivalry between the Kentucky Wildcats and the Louisville Cardinals, one of the greatest in all of college sports. Growing up in Louisville, one can't help but choose sides and develop one's debating skills, arguing with classmates, family and friends over whether Patrick Sparks traveled in 2004 or whether Rick Pitino is the modern-day basketball equivalent of Benedict Arnold. But given our connections to the University of Kentucky (and Taylor's fandom), the upcoming game and the tools at our disposal, we thought it might be time to wade in on the age-old debate between the two sides. A recent public opinion poll of Kentucky by Public Policy Polling piqued our interest, as it found that Kentucky fans outnumber Louisville fans in the state by an overwhelming 66% to 17% margin. But how do the two fanbases stack up on Twitter? We took to DOLLY to collect references to the two general-purpose hashtags used by fans of each team and promoted by the respective athletics departments -- #BBN (for Big Blue Nation) and #L1C4 (for Louisville First, Cards Forever) -- in geotagged tweets created between June 21, 2012 and December 20, 2012, in order to measure the both the absolute numbers and geographic distribution of UK and UL fans at the national, statewide and local scales as reflected by Twitter. According to the aforementioned poll's 66-to-17 margin, there are ~3.9x more UK fans than UL fans in Kentucky. This finding is mirrored almost exactly by our measures of tweeting, where the 6,371 geotagged references to #BBN in the state are also 3.9x greater than the 1,628 references to #L1C4. And while the number of tweets for each team are essentially equal within the city of Louisville, UK fandom becomes even more dominant once one moves outside of the Commonwealth, with there being over 10.5x more #BBN tweets than #L1C4 tweets in the US outside of Kentucky, for a total of 4.9x more UK tweets than UL tweets nationwide. So not only does UK hold an ever-so-slight advantage within Louisville's homebase, it shows increasing popularity as one moves to the larger scales of the state and nation. But when we visualize these tweets, we get a better idea for just how geographically concentrated these patterns of fandom are. 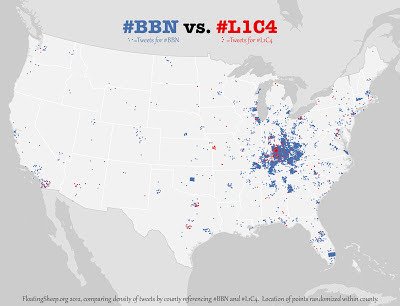 For instance, 599 of the 3,141 US counties had references to either #BBN or #L1C4. But of these, only 35 counties had a greater number of references to #L1C4, with Butler County, KY holding the dubious honor of being the only county in the Commonwealth with more references to #L1C4. Of the remaining counties, 554 had more references to #BBN, and only 10 counties in the country had an equal number of tweets referencing #BBN and #L1C4. Also interesting is that no county in the US apart from Jefferson County, KY (Louisville and Jefferson County have a merged government, and so are coterminous) has more than 100 tweets with references to #L1C4, highlighting the essentially limited spatial distribution of UL fans. 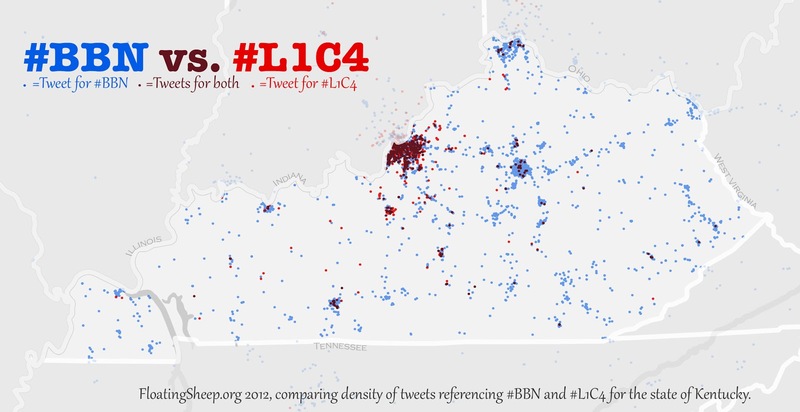 And though Jefferson County does have a few more UK tweets than UL tweets, one doesn't have to go far to find the county with the largest margin of UL-related tweets over UK-related tweets; right across the river from Louisville in Clark County, Indiana there are 20 more #L1C4 than #BBN tweets. Meanwhile, Kentucky holds a decisive advantage in its hometown of Lexington-Fayette County, with 1,588 more #BBN tweets than #L1C4 tweets. But the county with the second-highest margin favoring UK is all the way south in Broward County, Florida (Ft. Lauderdale) with a +299 margin favoring UK. 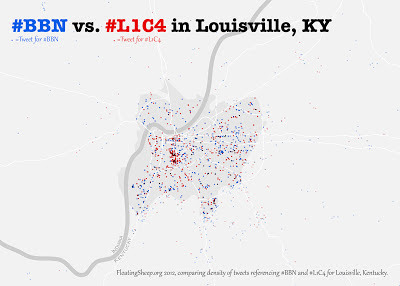 Within Louisville, the absolute number of tweets are almost equal, as mentioned previously; but, interestingly enough, the geographies of UK and UL tweeting are quite different. 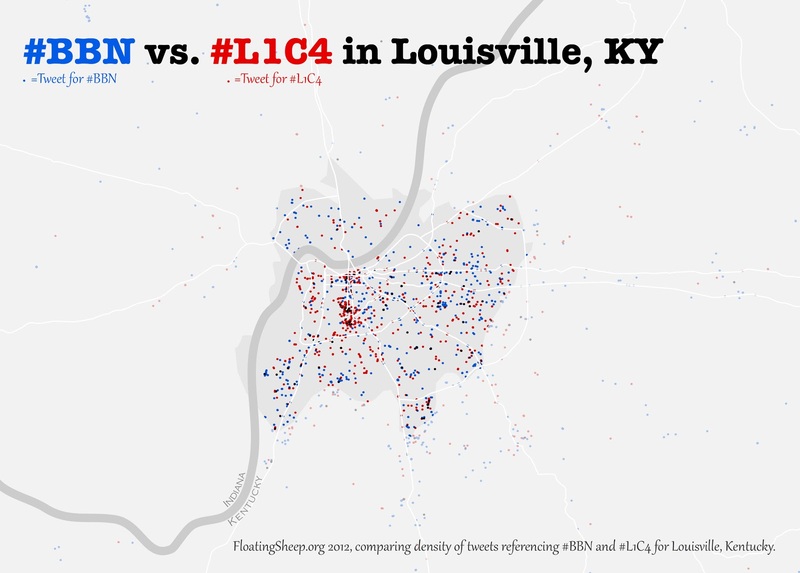 The clustering of #L1C4 tweets tends to be around the UL campus and downtown areas, while UK tweeting tends to be more spatially distributed, with many tweets coming from more suburban, residential areas in the city. So while the vast majority of UL tweets across the country are located in Louisville, a still significant number come from within just a handful of square miles surrounding the UL campus in downtown Louisville, perhaps indicating the limited appeal of a team that's lost four-straight games to the defending-champion Wildcats. In 2005, the Courier-Journal polled fans on their sports loyalties and 53.7 percent within the city counted themselves as UL fans compared to just 33 percent who identified themselves as Cats fans. And according to the two schools' alumni associations, Louisville understandably has a far greater base in Jefferson County (54,872 living alumni) than Lexington (16,112). But here's the catch: There are just 22,160 living Louisville alumni in the rest of the state and other than Fayette County (where Lexington sits), none of Kentucky's 120 counties boasts more UK grads than Jefferson. While we weren't aware of these figures at the time of our initial post, they not only tend to confirm some of our findings, but indeed only lend even more credence to our assertion that UK fans seem to be more voracious tweeters than their UL counterparts, as the roughly 50-50 split in tweeting in Louisville is significantly askew from the 54-33 numbers from the Courier-Journal's 2005 survey. Does the Pope Tweet in the Woods? 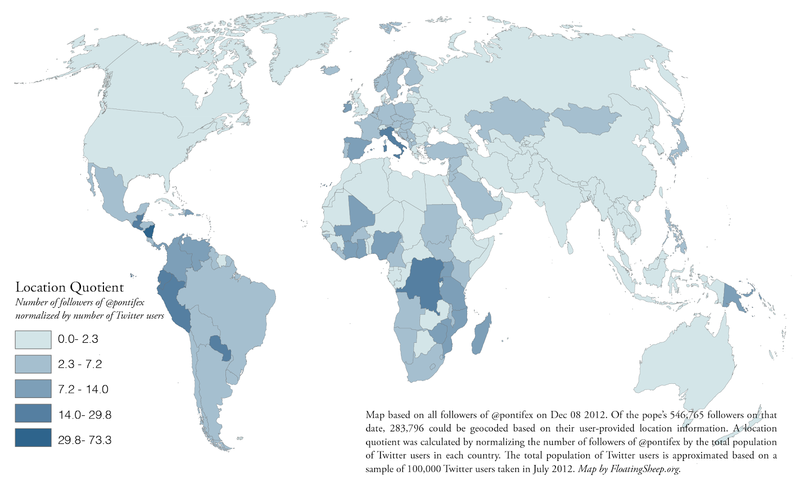 The Guardian posted one of our maps today on the spatial distribution of the the Pope's followers on Twitter. However, they decided not to use our suggested tag line "does the pope tweet in the woods?". We can't understand why. But rather than let this rhetorical gem disappear into the mists of the Internet, we're also posting the map here as well as a map on the location of tweets containing the term Pontifex (the name of the Pope's Twitter account). Apparently the pope is very big in Italy... who knew? We're also hiring a researcher in spatial statistics! In addition to our new position in Internet Geography, we are now also hiring a full-time five-month researcher to study the geographies of user-generated content and participation on Wikipedia. We specifically seek to employ a researcher with experience in quantitative geography or quantitative sociology in order to statistically explain national and sub-national patterns and geographies of Wikipedia articles and editing behaviour. Across the globe, daily economic, social and political activities increasingly revolve around the use of social content on the Internet. This user-generated content influences our understandings of, and interactions with, our social environment. Despite rapid increase in Internet access, there are indications that many people remain largely absent from websites and services, and many voices are absent from important platforms of information. We explore this phenomenon through one of the world's most visible and most accessed source of content: Wikipedia. 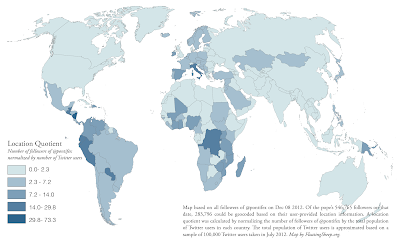 This project will employ a range of (primarily quantitative) methods to assess, explain, and model the variable levels of access, participation and representation on Wikipedia. Candidates should have a keen interest in platforms of peer-production and the geographies of online participation. We welcome applications from candidates with a background in statistical methods, a strong record of scholarly research, and a desire to co-author academic publications. Based at the Oxford Internet Institute, this position is available immediately for five months in the first instance, with the possibility of renewal thereafter funding permitting. Only applications received before 12:00 midday on 14th January 2013 can be considered. Interviews for those short-listed are currently planned to take place in the week commencing 21st January 2013. Please also feel free to get in touch with any questions about the position. We're hiring an Internet Geographer! We are hiring a full-time Internet Geographer at the Oxford Internet Institute! The position is for a researcher to work with Mark Graham on a project to study and map the Geographies of the Internet. This is an exciting role in which the researcher will both gather and analyse a range of Internet-related data and develop innovative and beautiful ways to visualise them. It is important to understand who produces and reproduces, who has access to, and who and where are represented by information in our contemporary knowledge economy. Building on existing work conducted at the Oxford Internet Institute, this project proposes a comprehensive mapping of contemporary geographies of the Internet using both primary and secondary data (examples of data that we propose to map include geographies of academic journals, intellectual property imports vs. exports, patents, Wikipedia edits and contributions, networks of Twitter mentions and followers, Facebook users, information takedown requests, contested articles in Wikipedia, content indexed in Google etc.). This one-year project will be divided into four stages. First, we will bring together and start collecting all necessary data. While some of the data are readily available in existing and open datasets, others require the creation of custom scripts and data collection tools. Second, we will use GIS and statistical packages to comprehensively analyse the data. Third, we will create visually appealing and state-of-the-art graphics and maps that clearly convey the geographies of access, information production, and information representation. Finally, we will broadly disseminate this work in a variety of open and accessible formats including free and interactive ebooks, an interactive website, a printed atlas, and academic journal articles. There may also be opportunities to gain teaching experience in some of the methods classes offered at the OII. Candidates should have a keen interest in the geographies of the Internet, a passion for visualising and disseminating results, and an exemplary record of creative activity or scholarly research. The successful applicant will demonstrate an ability to collect online data with scripting tools, analyse large datasets with GIS tools, and visualise results in both static and interactive formats. We welcome applications from candidates who are additionally keen to design a future research programme in Internet Geographies in order to extend the position. Based at the Oxford Internet Institute, this position is available immediately for 12 months in the first instance, with the possibility of renewal thereafter funding permitting.